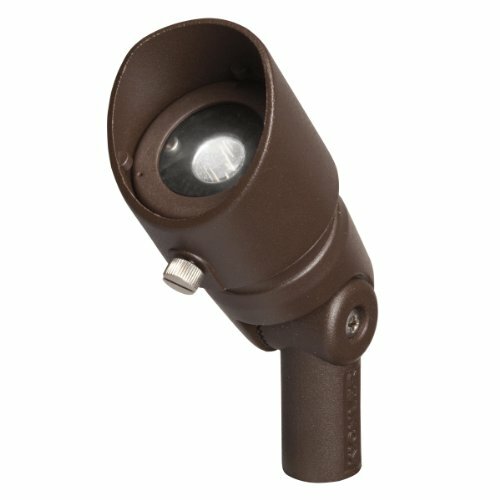 The Kichler Lighting 16000AZT27 Landscape Aluminum 12V/3W 1-Diode LED 10 Degree Adjustable Spot Light is a specification grade LED fixture that delivers tremendous energy savings while giving unparalleled performance. This LED accent operates in a voltage range of 9V-15V AC/DC , with no loss in light output due to constant current driver technology. The cast aluminum housing is finished with a marine grade powder coat in textured architectural bronze. That housing holds the integrated constant current driver needed to power the high output Cree LEDs which are tightly binned for color uniformity. Using 3W of power, the single diode produces a light comparable to a halogen 10W MR16. There’s no better solution for replacing your halogen PAR and metal halide lamps. A 10-degree spot beam spread will let you focus the warm white light exactly on the area of highlight. The 2700K color temperature returns a color rendering index in the 80s. Radiax optics will deliver 105 Lumens at an efficacy rate of 35 lumens/watt and that equals energy savings that help the bottom line. Measuring 3.7-inches high and 2-inches in diameter, the 16000AZT27 has a 115-degree aiming capability. It includes 24-inches of 18-2AWG, SPT-1W wire leads, pro-series wire connectors and an 8-inch in-ground stake for easy installation. Sold one per package. Optional mounting brackets and accessory lenses are available and sold separately. UL, CSA and ETLW listed for wet location installation. Since 1938, Kichler Lighting has offered a distinctive array of lighting solutions that reflect your individual personality, tastes and plans. Kichler brings you an unparalleled variety of exciting style families, unique finishes, fresh colors and unequaled quality. Whether it's casual, contemporary, transitional or traditional, you'll find it with Kichler, lighting that defines your style.